MINNEAPOLIS — It’s 10 minutes after the end of the SiriusXM Futures Game on Sunday, the end of his afternoon as an honorary coach for the top prospects in the game, but Twins legend Tony Oliva doesn’t want to leave the dugout. He’s standing on the top step with his hands on his hips and his chest out, proudly displaying the World logo embroidered across his jersey and the tiny Cuban flag patch stitched on the uniform near his heart. Twins special assistant Tony Oliva celebrated his 76th birthday on Sunday. The eight-time all-star remains a beloved figure inside the Twins clubhouse and throughout the team’s fan base. One by one they have come through Target Field the past few seasons, wide-eyed young players making their first visit to the Twin Cities. Each time, the same kindly septuagenarian has been there to receive them, to offer a friendly greeting and a few carefully chosen words of advice. Twins legend Tony Oliva was welcoming them into the club. Not in terms of Minnesota baseball, but in terms of wondrously talented hitters born in the troubled island nation of Cuba. So, it was only fitting this week, as Yoenis Cespedes repeated as Home Run Derby champion and Yasiel Puig and Jose Abreu each made their all-star debuts, that Oliva was here to welcome them to an even more exclusive group: Cuban all-stars. Rod Carew, the hall of famer and former Twin who was named to 18 All-Star Games and will make the ceremonial first pitch at Tuesday night’s All-Star Game at Target Field, served on the Expansion-Era Hall of Fame committee that in two weeks will induct ex-managers Bobby Cox, Tony La Russa and Joe Torre in Cooperstown, N.Y.
“I told the president of the Hall of Fame that the only way I would be on that committee is if I could be on the next committee when (former Twins teammates) Tony (Oliva) and Jim (Kaat) come up (for election),” Carew said. MINNEAPOLIS (WCCO) — Four years after the Twins arrived in the land of 10,000 lakes, Minnesota was the center of the baseball universe. Nearly 50,000 fans crammed into Metropolitan Stadium to watch the All-Star game . “It brings me a lot of memories,” Tony Oliva said. 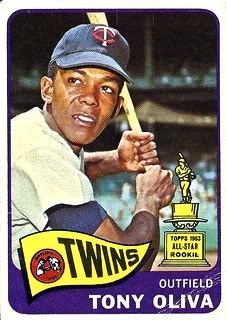 While Tony Oliva would have my vote for the Hall of Fame, those who really have a vote have not seen the light. A look at his stats confirms…he belongs!